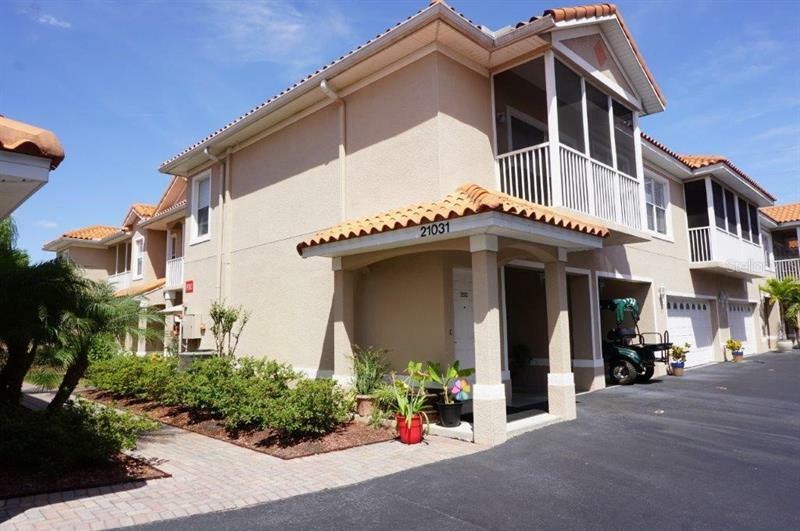 Light and bright 2-Bedroom/2-Bath condo with neutral colors and open floorplan. Kitchen features granite counters, smooth-top range, built-in microwave, and pantry. Combination living/dining rooms with covered screened balcony. Master suite offers dual-sink vanity, garden tub, walk-in tile-surround shower, and two spacious closets. Private covered, screened balcony off master with additional storage closet. Second bedroom with closet and full bath with tub/shower combination. Newer AC, interior paint, ceiling fans, and water resistant vinyl plank laminate flooring. Inside laundry accommodates full-size washer/dryer and extra shelving. Extended garage with large storage room. Buyer to verify all info and dimensions. Condo association approval of Buyer required including background check.